Karishma Vora is a dually qualified barrister in India and England – one of two presently practising commercial law in England, the other being Mr Harish Salve, to have had a blossoming practice in India before being admitted to the English bar. This makes her an attractive choice for matters involving either or both jurisdictions. She graduated from GLC and started her career as a litigator in Mumbai in 2003, having worked at the chambers of senior counsel Mr Janak Dwarkadas and Mr Zal Andhyarujina. She has been in London for six years now and is frequently instructed in cases involving Indian parties. Karishma has a substantial advisory and court practice in commercial litigation and international arbitration. She specialises in business and banking disputes and has worked on a range of matters from interim injunctions to complex cross-border trials. She is also an alumnus of the London School of Economics (LSE) and has taught commercial law at the LSE Summer School. She is presently elected to the prestigious Gray’s Inn Barristers’ Committee for a three year term. 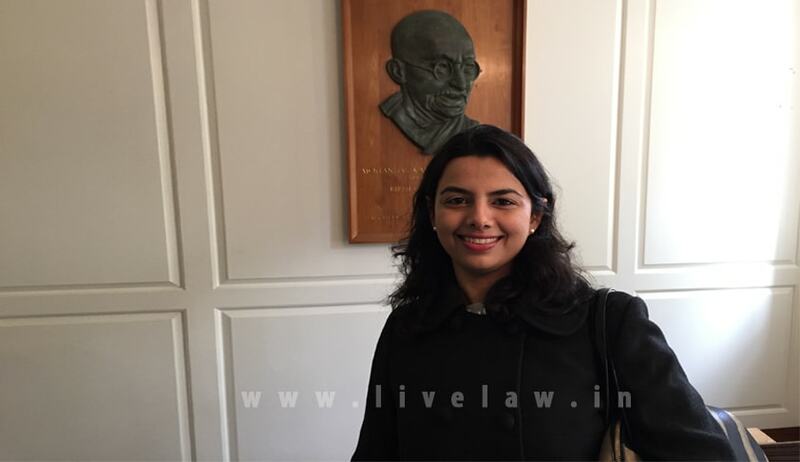 Live Law : Karishma, you joined Government Law College, Mumbai, after a degree in Management Sciences at the London School of Economics. What fuelled your decision to change career to law? Karishma Vora : Most of my peers at the London School of Economics became investment bankers but finance did not much interest me. Friends and family considered my decision to move back to Mumbai after LSE crazy, but my love for the law had me convinced it was the right choice. At the LSE, we were allowed to pick one subject outside our main stream of study. I picked Commercial Law and thoroughly enjoyed the ‘story telling’, which is what I thought of the English judgments during lectures given by the well respected Prof Hugh Collins (now Vinerian Professor of English Law at the University of Oxford). The affinity I developed towards commercial law encouraged me to read Public International Law in the following year. It was 2003 and the allied forces were preparing to attack Iraq. The course was taught by two lecturers: Prof Christopher Greenwood who was then advising Prime Minister Tony Blair to attack Iraq, and Prof Gerry Simpson who thought it was perfectly acceptable to ‘do nothing’. It was fascinating that two professors of the same course held opposing views. I was convinced that the pursuit of law would bring excitement to my life and that it was my calling. At college when one must complete homework of several subjects, but consistently chooses to pick a book on the law over a book on management or finance, one realises a choice has been made. Live Law : How do you look back on your `Life at GLC` and the contrasting difference with your `Life after GLC` that soon followed? Please also share your experience about the unmatched advantage of the internships offered by GLC. Karishma Vora : My time at GLC was full of life. Everything about the law was novel. There was not a care in the world other than participating in the next moot court and hanging out in the canteen. I made six applications under the then GLC internship scheme. Six was the maximum number of applications a student could make and I was privileged to have been interviewed and offered a place by all six. I was, however, at a loss when making a choice. Being the first lawyer even amongst extended family who did not know the difference between a law firm and a counsel’s chambers, I almost made a wrong choice. I will be forever grateful to my friends Rohaan Cama and Murtuza Federal who were quick to point out that an offer of an internship by Mr Janak Dwarkadas, SC was unrivalled. I interned at Mr Dwarkadas’ chambers for one year. Despite his stellar career, he was kind and encouraging. He taught by story-telling, which we juniors thoroughly enjoyed. I learned many soft skills by shadowing him. For example, court craft and how to address every judge differently, how to balance a conference between clients and solicitors, to approach legal research and so on. I also built a lifetime of a legal network that has held me in good stead even in London. The GLC internship program opened the doors to Mr Dwarkadas’ chambers, which in turn opened the doors to Wadia Ghandy & Co, which was a fabulous firm under the visionary leadership of the late Mr Anand Bhatt at the time. Immediately after GLC, as a final year articled clerk at Wadia Ghandy, I built a solid foundation in litigation. I was encouraged to make as many court appearances as possible and soon developed a reputation that I was willing to go to court at the drop of a hat. My advocacy blossomed with the faith that partners such as Ashok Paranjpe and the Wadia Ghandy court clerks had in me. I learned from Mr Paranjpe , that increased levels of faith in juniors, augments their levels of confidence and fuels growth. Live Law : Despite establishing a flourishing legal career in Mumbai, you had to uproot yourself and move to London. Please share with our readers the difficulties to break into the Commercial Bar in England. Karishma Vora : Re-qualifying as a barrister of England and Wales and breaking into the English commercial bar has been one of the toughest situations I have faced in my life. Given that I left a robust and successful practice in India, facing the peak of the recession in the UK in 2009 was a shock to the system. The only secret was perseverance. I remained focussed and followed up every connection, no matter how remote. This included connections I made at the compulsory ‘dining sessions’ at Grays Inn, where I made friends who guided me through the bar exams and gave me tips on pupillage applications. To demonstrate how difficult the system is, I should quote from a speech made by the Treasurer of Grays Inn at the Call to the Bar ceremony. He congratulated us on becoming barristers but added that we should keep an open mind as over 90% of us would not get pupillage and would not be able to practice as a barrister. Live Law : Despite being ‘Called to the Bar’, you could not practice without a Practising Certificate. Please elaborate the concept of ‘pupillage’ that must be completed before one begins their actual practice in England. Karishma Vora : The completion of pupillage is necessary to get a Practising Certificate. Pupillage is compulsory training where an aspiring barrister must work under a practising barrister. It is usually a year long, but the Bar Council had waived six months for me, bearing in mind my experience as a litigator in India. Live Law : Despite the fact that obtaining a pupillage is nearly impossible, you were awarded pupillage by Fountain Court, one of England’s magic circle sets of Chambers. Describe your experience on being exposed to the English bar for the first time. Karishma Vora : It was thrilling to have secured a pupillage at Fountain Court chambers. Fountain Court had about 60 barristers of varying levels of seniority from one year call to about 30 years of call. Pupillage was a formal affair at the end of which the chambers took a decision on whether or not to absorb the pupil. Unlearning the Indian style of drafting and replacing it with the English style was my most important learning. We were trained for everything – how to conduct oneself in court, how to interact with our pupil masters (including how one must leave the room if they received a personal call), when to meet the clerks and examples of conversations we could have with them, the practice of professional ethics and so on. The system of clerking felt like pristine packaging over an age old system. It was amusing to note how clerks brought work for the barristers and negotiated fees on their behalf. I could not help but think of the court clerks in Mumbai, who performed an entirely different role. Live Law : What was the contrasting difference that you observed between the English Legal System and the Indian Legal System? Karishma Vora : One of my friends who is a lawyer in Mumbai was able to make it to my first court appearance in England. It was a County Court trial concerning misrepresentation. He complimented the fact that I had adopted a polite undertone in my advocacy, which was a contrast to my previous vociferous style of arguing in India. His positive remarks made me realise I had, after all, broken into the English bar. That day at the County Court is memorable for other reasons too. I was trained to be wigged and gowned at the County Court. My opponent, who was dressed in a suit, politely said “one of us is incorrectly dressed”. I had not appreciated that when a District Judge sits in the County Court, the hearing may not be wigged and gowned. Additionally, I was given the number 3553 as the passcode for the robing room. Upon reaching it however, I could only see three vertical buttons. Luckily a fellow barrister pointed out that pressing the first and last button together made number five. Another example comes to mind. I marshalled with a Lord Justice of the Court of Appeal. Although I was called during a ‘busy’ week, the judge had two reading days and only three matters on board that week that were listed for between 30 minutes and two hours on the three remaining days. What a contrast to the burgeoning courtrooms in India! This is because England is a costs jurisdiction, where the losing party pays costs of the winning party. This has successfully reduced their case load. It is intriguing that costs in England sky rocket during procedures one would not imagine in India such as disclosure (akin to inspection). There is no dearth of work in India. In England, one has the luxury of time to prepare for a case i.e. one can spend longer developing arguments, researching the law and funnily, conferences last much longer too. In England, matters are determined swiftly, with even complex commercial matters reaching trial within about two years. Permissions to appeal are granted with caution and there is finality to litigation. Although the application of the law is similar in both countries, the procedure is greatly different. England has made procedure simpler for the lay person to understand. They have done away with latin phrases and have, for example, changed the word ‘plaint’ and ‘plaintiff’ to a ‘claim’ and ‘claimant’. Professional ethics standards are extremely high and well regulated in England. For example, barristers cannot lend their name to an appeal if it is, in their opinion, devoid of merit. One can allege fraud only when one has seen convincing proof. One cannot ‘coach’ a witness before they are cross examined. If a barrister breaches the Code of Conduct, he/she can face a wasted costs application personally or a disciplinary action resulting in a fine or suspension from practice. This also means that our insurance premiums, which are compulsory, are dear. Live Law : You gained ‘tenancy’ at a leading set of Chambers called 4-5 Gray`s Inn Square. Please tell us about your team and the kind of work culture that is followed there. Karishsma Vora : 4-5 Gray’s Inn Square is a leading set of chambers that has seen the likes of Michael Beloff QC, Cherie Blair QC and Prof G H Treital as members. My chambers are well known for commercial and public law. This is a great combination as increasingly, there is a tendency to use public law arguments arising out of European laws as defences in commercial matters. I share my room with Richard Clayton QC, who has written leading public law books, and this is just one example of the intellectual strength of my chambers. One of my Heads of Chambers, Timothy Straker QC, was Silk of the Year a few years ago. Unlike a solicitors firm, every barrister is self employed and there is no system of a team. We may be lead in some matters, lead juniors in other matters and in both cases the barristers we are working with can be from within or outside chambers. The culture in chambers is relaxed, just as most chambers in England where one can come and go as they please. Work from home in case they are doing advisory work and do not need to be in court. We are free to walk into each other’s rooms to bounce ideas or discuss cases confidentially. I also feel privileged as my chambers looks onto a beautiful 15th century square on one side and immaculate gardens maintained by Grays Inn on the other. Live Law : Karishma, you and Mr. Harish Salve are the only Indian advocates who are currently practising commercial law as barristers of England and Wales, having previously had a blossoming practice in India. You also taught commercial law at the London School of Economics and have also been elected to the prestigious Grays Inn Barristers’ Committee. All this in your early 30’s. What is yet to be achieved? Karishma Vora : It is flattering that you make reference to Mr Salve and me in the same sentence. There is a lot to be enjoyed. The best part about counsel practice is that there is something new to be learned everyday. There is a challenge in every case and a thrill each time that I enter court. I hope never to lose this spark and to live up to the faith imposed in me by my parents and all my teachers. There is also a spiritual path that one hopes to achieve. Live Law : Do you retain ties with India? Karishma Vora : Absolutely. I visit India about 3-4 times a year as 90% of my instructions come from India. I feel privileged because solicitors who used to instruct me when I was at the Bombay High Court have retained their trust in my work and continue to send me instructions in London. I am instructed on arbitrations seated in London, arbitrations seated in Singapore where English law or Indian law applies or commercial litigation before courts in England and Wales. I am often asked to provide advice on pursuing litigation in England or to advise on strategy when there is litigation ongoing in other jurisdictions such as before the Company Law Boards, DRT or BIFR in India. I have the ‘public access’ certification as well as the ‘right to conduct litigation’ which enables me to accept instructions from Indian advocates directly, without the need to route the instructions through an English law firm. Live Law : It is immensely inspirational to learn about your multitude of achievements at this young age, by your sheer hard work and determination. What is your message to law students who might wish to settle abroad in the future? Karishma Vora : It would be sensible to start the re-qualification process before moving to England. If one would like to re-qualify as a solicitor, please check the website of the Solicitors Regulation Authority (SRA) and the Law Society of England and Wales. To re-qualify as a barrister, visit the website of the Bar Standards Board and the Bar Council of England and Wales. Try and get your character certificate before leaving India. Many young persons have difficulty obtaining this after moving abroad as the Indian Bar Councils require that it be collected in person. Note that it is only valid for three months from issuance. Take up free internships or paralegal positions to get a foot in the door. It is easier to find a job when one is in work rather than when one is looking for work. Enrol with legal recruitment firms to get paralegal positions.